Australian Warehouse Solutions specialises in providing a range of innovative and cost-effective packaging solutions. 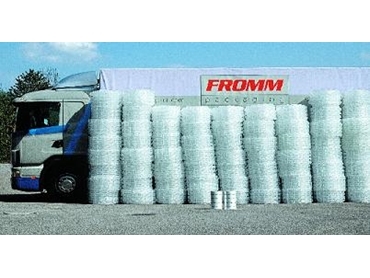 The company offers the Fromm Airpad AP502, a customised solution for void fill issues. Fromm Airpad AP502 can be used to make void fills onsite eliminating the use of valuable space in the warehouse to store void fill material. The size of the void fill can be customised and the void fill can be made to suit specific requirements with one touch of the Fromm Airpad machine’s button. Fromm Airpad AP502 is a small, portable machine that requires no operator and one touch of a button can create void fills in six different sizes. The film is perforated allowing the user to easily tear it off at the required length. Along with a range of pad sizes, this allows users to effectively customise their protective packaging procedure. Using a Fromm Airpad machine is half the cost of protecting products with bubble wrap or polystyrene pieces, and is half the weight of loose fill material, which also saves on transportation costs. The Airpads are wound into large rolls directly from the machine and two rolls of Fromm PE film make enough Airpads to fill two semi trailers. The Airpad is a light product with superior absorption capacity. Using Airpad BOPA/PE 42 micron film, one Airpad can survive an impact of over 1000kg. Each Airpad can easily be reused or alternatively the film is completely recyclable. Electrical and computer goods can also be protected using Fromm anti-static film. Australian Warehouse Solutions (AWS), the sole distributor of the Airpad has factory trained, qualified sales personnel to provide demonstrations or evaluate client applications in Sydney Melbourne and Brisbane.